I know I been primarily keeping this blog as part of my photo blog. But I intentionally kept it the name design within my blog name. I been wanting to do some industrial design especially doing woodwork or metal work in additional to my photography. I been an avid audiophile probably longer than I been a photographer. I figure this outlet would be the perfect blog to merge some of my hobbies together. Anyways, I finally got around to finish a project that’s been on my back burner. 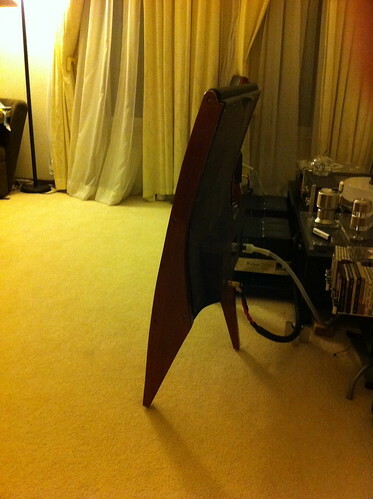 It’s a custom speaker stand made for the famous Quad-57 speaker. I was able to find a pair of Quad-57 that have been fully redone over a year ago. 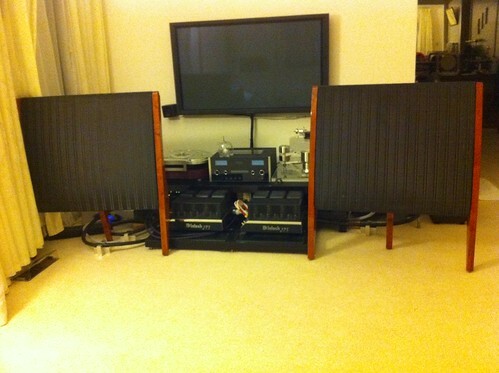 The sound that comes out of these speakers are amazing. Especially for the midrange vocals. 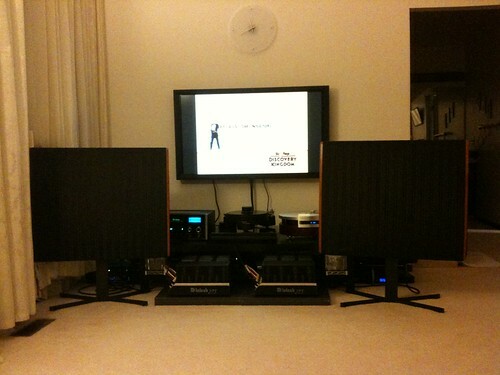 Playing these speakers with vocals such as Frank Sinatra, Norah Jones, Diana Krall, etc. is like having them performing in your room. You wouldn’t believe the clarity and the sonic performance that these vintage electrostatics can perform. One gripe I always had was the steel stands that I had these on. They were black and spiked which was unobtrusive, but still looks more like an after thought. 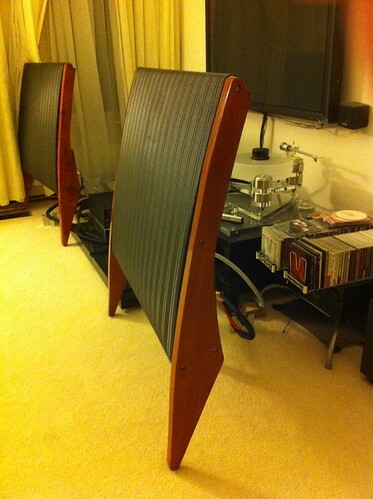 As I search through the internet, I came across Quad Musik Germany that produced a stand that turn these vintage speakers into a modern sculpture. Not having enough details or where to purchase these stands, I started to look for ways to DIY my own pair. Luckily, I ran into a nice fellow from UK name Martin off pink fish media. He had the exact thoughts I did. Not to mention he successfully diy his own pair with white finish. It was amazing. After a few email correspondence, he provided me enough information and pictures of his build out that got me started on my own set. It was a labor of love. After a lot of measuring, I made a paper template. Then I had a friend help me cut the rough shape for me. After that, it’s 2 full week of sanding and finishing. Since this is mainly a photography blog, I will be taking better pictures of this setup in the future. In the mean time, enjoy the iPhone pictures. Here is a picture of what the original stand looked like. Here is a picture of what the finished stand looks like. And here is some picture of in progress. It’s been a while. I’ll have to see if I still have the plans somewhere. 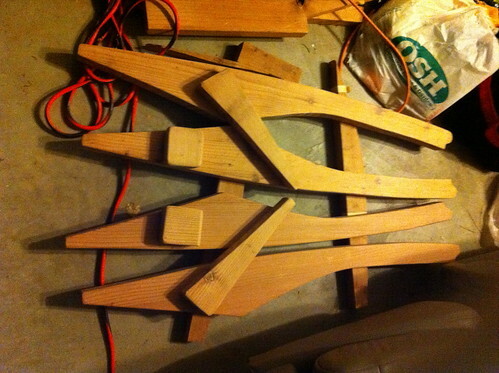 I actually use butcher paper to create 1:1 scale of the stands as a stencil for cutting then did a lot of sanding. 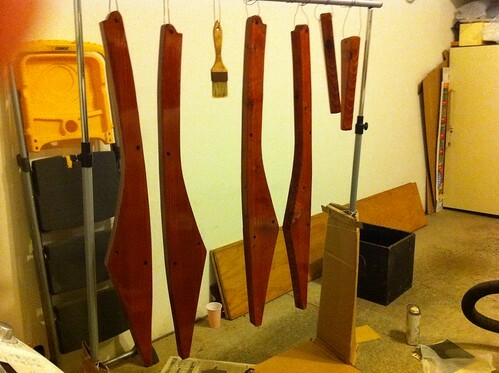 Make some prettier stands for them. Any help would be appreciated. I currently don’t have any time or plans to recreate the stands. They were a summer project that took many many weeks. Especially when you don’t have all the right power tools. 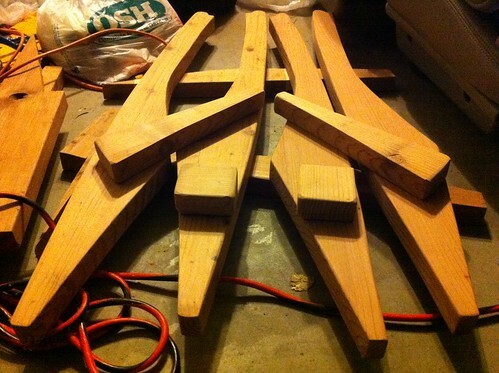 Most of the cutting/sanding were all done by hand with hand tools in the backyard. If I ever do decide to tackle another one, I’ll let you know.